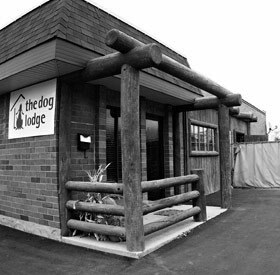 The Dog Lodge Difference is evidenced in our home-like atmosphere which provides a safe, comfortable environment for your pet. Guests have constant supervision and interaction. Whether they’re chasing each other through the indoor, climate-controlled playroom or lounging on one of the many sofas and beds, there is plenty of room for fun and games or just a relaxing afternoon. For those guests who enjoy the great outdoors… the secure, outside yard has an abundance of fresh air, sunshine and room to run. Summer is particularly enjoyable for our guests. Wading pools, water toys, lounge chairs and many shaded areas provide hours of enjoyment for our furry friends. The outside yard is gravel-free which means your dog will not ingest pebbles, will stay cleaner and will not be able to dig out. Convenient freeway access from both I-15 and I-215 makes The Dog Lodge easily accessible from anywhere in the valley. We are just minutes from the Interstates, but are secluded from any noise and traffic.